This is another software we’re going to discuss today. The name of the software is Flip Image that helps you create animated flipping digital photo albums that behave like actual photo albums. 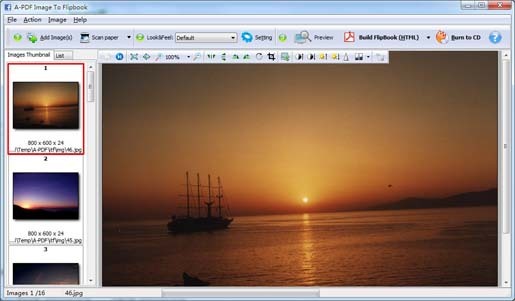 Moreover, you can import hundreds of images from your computer, scanner or camer, and then generate a flipping album which can be viewed online, sent by email or even burnt to CD. The software Flip Image lets you control your album size, colors, background, and more without any programming work. 1.Drag the corner to flip a page. 2.Click page shadows to flip a page. 3.Input password to unlock encrypted pages. 4.View with important pages pre-loaded to open quickly, no need to wait for all pages to be loaded. 5.Use Previous, Next, First or Last buttons to navigate through the pages. 8.View page-flipping eBook full screen. 9.Use page thumbnails to navigate. 10.Print out the whole eBook or a selected range of pages. 11.Download the uploaded page-flipping eBook direct from the web site. 12.Double-click to zoom in or zoom out. 13.Zoom in/ out both pages. 4. Add Frame and clipart to images. 5. Set page size, layout, margin, position, etc. 6. Save and Load your defined pages as project. 7. Build Flipbook, PDF, images, TIFF (email or FTP PDF directly).